The ‘factors of production’ is an economic term used in the production of goods and services to make a profit. But what I failed to grasp for a long time is that these factors of production are actually the factors of wealth. To create an ‘economic profit’, you have to make use of these factors if you want to be a wealthy individual. As usual, I would use stories from companies to highlight each of these factors of wealth. Note that they are not listed in any particular order. According to Andrew Carnegie, 90% of millionaires become so through owning real estate. The U.S. boasts 29 real estate billionaires, the greatest number of any individual nation . China has the second highest number at 21, followed by Hong Kong with 18 real estate billionaires. In Forbes Billionaires list 2014, Hong Kong’s Lee Shau Kee ranked at No. 35 with an estimated fortune of $19.6 billion. His projects include Henderson Metropolitan and Henderson Land Development. Since 2014, Lee Shau Kee has been overtaken by Wang Jianlin, China’s richest person. Wang owns shopping plazas, luxury hotels, and different entertainment centers around China. He became the world’s largest theater owner when he purchased the AMC theater chain from the U.S. in 2012. He also owns 20% of the Spanish football club, Atlético Madrid. Wang, a man from humble beginnings, entered the military and became chairman of Wanda in 1989, when he was only 35. He is now the Chairman of Dalian Wanda Group. China’s largest commercial real estate developer. Lee Shau Kee and Wang Jianlin are an example of how real estate. can give you great wealth. 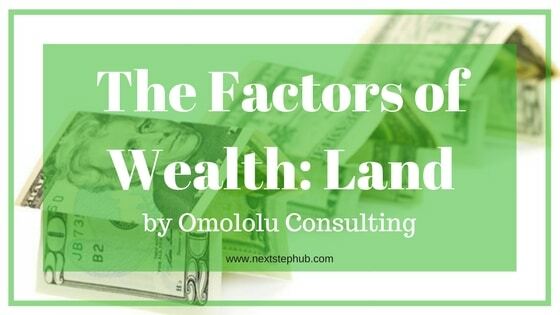 Real Estate or Land is a great way to accumulate and grow wealth. During Andrew Carnegie’s time, most of the millionaires were real estate owners. Today, most of the people with a net worth of over $1M have a huge component in real estate. According to KnightFrank, a global real estate consultancy firm, Ultra-High-Net-Worth-Individuals (UHNWI’s) committed 40% of their portfolio to real estate investments. HOW SHOULD REGULAR PEOPLE INVEST IN REAL ESTATE? I have invested so much in real estate. By extension, my venture capital firm invests in projects related to real estate. I invest in individual projects as well as real estate technology (RealTech) ventures. Airbnb is an example of a RealTech product. Zillow is another interesting one. I recently invested in Afriscaper, an Africa-focused real estate crowdfunding platform launching soon. If you are interested in Afriscaper, you can download the whitepaper here. These RealTech ventures are one way to invest in real estate. If you cannot afford real estate in your city or country, you can buy real estate in another city or country. Another alternative is joining a real estate investment trust or a crowdfunding platform. These offer you a low entry investment point as investments usually start at $1,000 to $5,000. You can also lease real estate properties and rent them out on platforms like Airbnb. You have so many options! Before I leave the topic of real estate as a factor of wealth, I should make one clarification. Real estate is not a residential building. It could be a mall, a piece of land, a retail center, a ranch, a movie theater, a gym etc. Get the picture? This is only the first factor of production. If I attempt to do cover all factors today, this article will become too long. I will write about one factor of production daily, meaning 4 parts. Don’t miss any of the editions, I recommend you subscribe to my mailing list here. Tell me your opinion: Have you invested in real estate? What have your returns been like? If you haven’t would real estate interest you? Do you have any income goals? What would a real estate investment mean to you? Squarespace vs WordPress: Which is the Best Platform?